While we were in Ireland in May and June of 2018 we were all over the country. I don’t remember what city or town that we were in at the time I took this photo. The laundry hanging on the patios of the building is what caught my eye. The reason is because there’s something very nostalgic about air drying laundry. 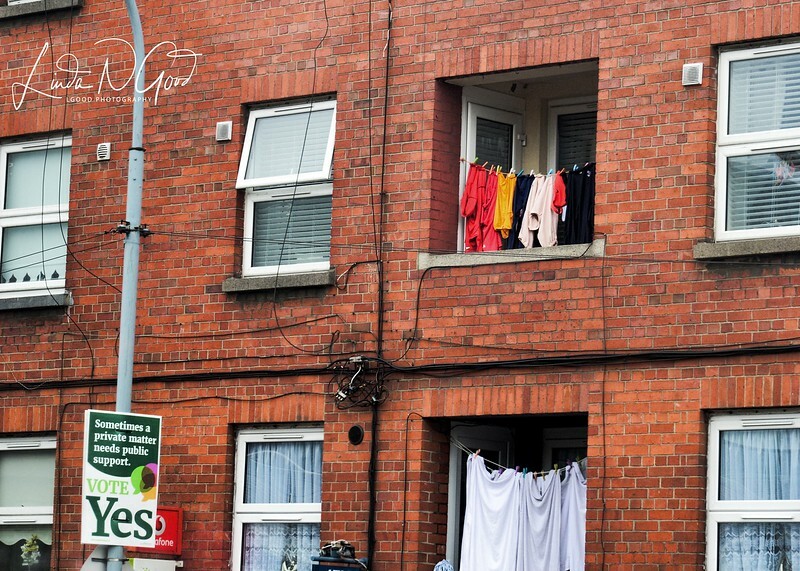 When I was a kid – that’s the only way we had to dry our clothes. I still today remember the wonderful fresh smell of the clothes and particularly the bed sheets after they were outside on the line. This shot is certainly not my best, but it made me smile and made me think of happier and more simple times. “I really like doing the laundry, because I succeed at it. But I loathe putting it away. It is already clean.” ~ Jenny Holzer I can totally identify with this quote: I don’t mind the washing and drying – I don’t even mind the folding, but I just trudge around the house when I have to put everything away. But then, when it’s all done – LIFE IS GOOD. LOL. Have a simply happy day today my friends! Fine find ! No matter what it works !! A time tested method !! Wonderful capture Linda, ah yes, hanging the laundry outside. My favorite was putting the bed linens out on the line to dry, especially in cool weather or first thing on a crisp spring morning. The fresh smell of clean country air to then snuggle in bed for the evening, yes, yes & yes!!! Great shot, brings back memories! It's fun reading all the comments that this one image generated, including many nostalgic ones. I concur with a lot of these--we always hung the laundry in the back yard, growing up. In rainy weather, we had a wooden folding rack that we put over the floor heater (I'd completely forgotten that until I started typing this comment.) My mother talked about washing and hanging out cloth diapers for two twin babies (my sister and me) up in Alaska in the winter. She would shake out the diaper, and whatever shape it took in the wind, was how it stayed, instantly frozen! Re: arctangent's comment, my mother talked about how growing up in Massachusetts, it was required that women's underwear be hung inside of a pillowcase so the neighbors couldn't see it! Sorry about going on so long, but this just shows how evocative a simple photo can be! You captured a great reminder of yesteryear for many of us. I think this resonates with a lot of us who are older. Now there are neighborhoods in this country that forbid outdoor clothes drying! It wasn't all good, though. Bringing frozen laundry inside and having to deal with it isn't such a treat. And for the people whose laundry you photographed, they have to live with having their neighbors and even total strangers knowing all the details, some of them intimate and embarrassing, of their washables.